Many people have asked me how to make almond ‘milk’. It is so easy to make and I am very embarrassed that I only started making it last year. Until then, I went through one tetra box a week. I was shown, in like 5 min, how to make it at the raw food class I took last year. When I got home, I looked back through my yoga & raw cookbooks and found a few more explanations that I remember flipping right past because they seemed ‘hard’. Why I thought this I have no idea. I have tried so many more complicated things and I guess the simplest of them seemed the most intimidating. Once you learn how to make almond ‘milk’ the biggest challenge is deciding what to do with the almond meal. You have seen many uses for it on this blog as I am a bit passionate about finding new and healthful ways of using it – I have baggies of it stored oldest to newest in my freezer 🙂 What I have discovered is that looking for ways to use the almond meal also encourages other healthful eating. So besides the obvious benefit of making fresh almond ‘milk’, another real benefit is the continuous learning and healthful adaptations you can make to your overall diet. Awesome. Now, I order organic almonds from BC (see previous post on Real Raw Food) but you don’t have to. Make it simple, buy raw almonds, not toasted, from anywhere you normally buy them. Of course organic is better, but as per my ‘About’ page, I am not dogmatic and if you need to change the rules to start, do it, or you won’t try it. If you are a Costco shopper, I have tried it using their bags of almonds, worked out just fine. Soak 1 cup Raw Almonds in filtered water for 8-12 hours. You are ‘sprouting’ the nut. Rinse them a couple of times, but you don’t have to, I have left them overnight on the counter, no problem. After soaking, rinse them well. You’ll probably have 1 1/2 cups of sprouted almonds. Before blending set up a few layers of cheese cloth draped into a large bowl or measuring cup. If you love making nut ‘milks’ then buy a nut ‘milk’ bag at Community Foods, much easier. They cost like $12 or something. In a blender add the almonds and 2 1/2 – 3 cups of filtered water, play around with the consistency. I usually use 2 2/3 c. If you have a smaller blender, add half at a time. Blend until as smooth as possible. 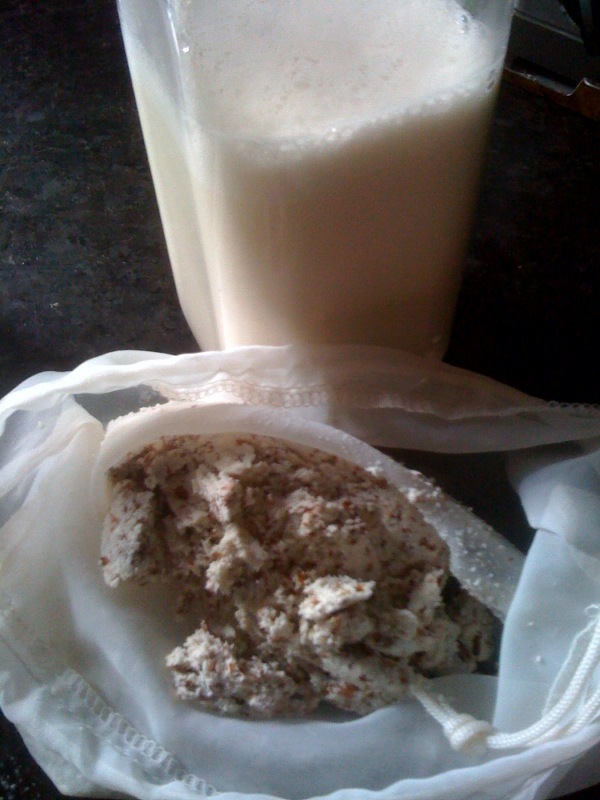 Pour into the cheese cloth/’milk’ bag and drain the liquid into the bowl. Squeezing every last drop. Put in bottle/jar, done. Seriously, you’re done. Now, there are variations to this recipe. I like it plain, but you can add the ‘milk’ back to the blender and add a 1/2 tsp of pure vanilla extract (or half vanilla bean if you have a Vitamix) and 3 pitted dates, blend until smooth for sweetened vanilla ‘milk’. I’d say without a Vitamix blender the dates will be lumpy, so use Agave Nectar instead, try a tbsp at a time until you have the right sweetness. Use cacao powder and natural sweetener to make chocolate ‘milk’. You can make ‘milk’ with other nuts as well, like brazil nuts and hazelnuts but do some research about the soaking of each. Not all nuts need soaking. 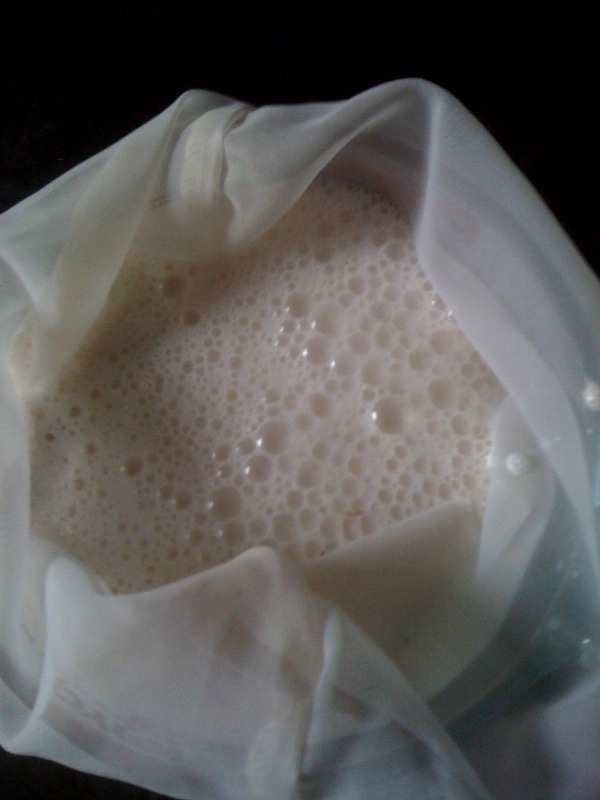 The ‘milk’ stores in the fridge for 5+ days, I make enough for the week and start over. I freeze each batch of almond meal and when I need it, thaw it and use it wet or dry it in my oven at 200F for 90 min or so, stirring it around on the baking sheet every 15 minutes. I usually keep a jar of the dried meal in the cupboard so it is ready to make cookies, pates and such. You’ll be amazed how many things you can replace almond flour for in recipes, just throw it in the food processor to grind. 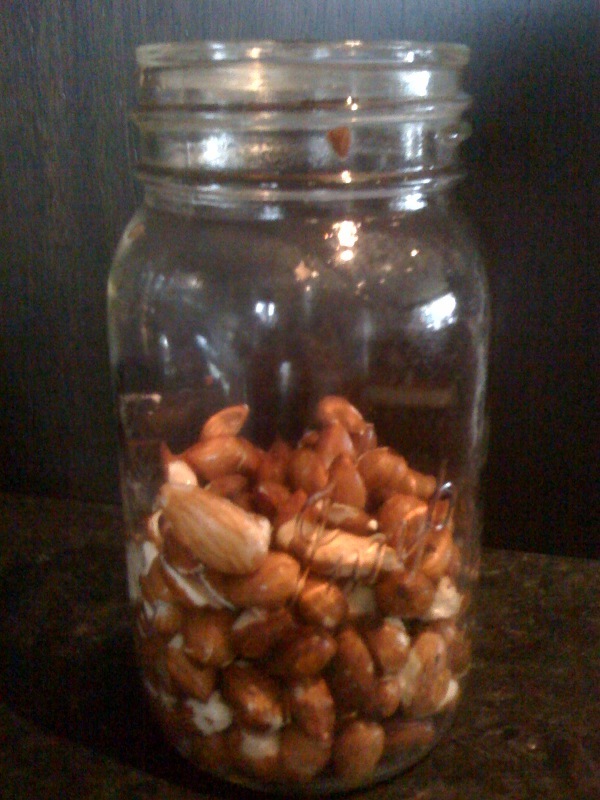 Here are some pictures: first one is of the soaked almonds, notice how puffy and big they are. The second is the freshly blended almonds and water sitting in the ‘milk’ bag inside a 4c pyrex measuring cup. The third is what the meal looks like with the milk bottled behind it. Try it.